"It's a way of putting nearly any kind of material into a 3-D pattern with nanoscale precision," says Edward Boyden, an associate professor of biological engineering and of brain and cognitive sciences at MIT. Boyden, who is also a member of MIT's Media Lab, McGovern Institute for Brain Research, and Koch Institute for Integrative Cancer Research, is one of the senior authors of the paper, which appears in the Dec. 13 issue of Science. The other senior author is Adam Marblestone, a Media Lab research affiliate, and the paper's lead authors are graduate students Daniel Oran and Samuel Rodriques. By reversing this process, the researchers found that they could create large-scale objects embedded in expanded hydrogels and then shrink them to the nanoscale, an approach that they call "implosion fabrication." "You attach the anchors where you want with light, and later you can attach whatever you want to the anchors," Boyden says. "It could be a quantum dot, it could be a piece of DNA, it could be a gold nanoparticle." "It's a bit like film photography—a latent image is formed by exposing a sensitive material in a gel to light. Then, you can develop that latent image into a real image by attaching another material, silver, afterwards. In this way implosion fabrication can create all sorts of structures, including gradients, unconnected structures, and multimaterial patterns," Oran says. "People have been trying to invent better equipment to make smaller nanomaterials for years, but we realized that if you just use existing systems and embed your materials in this gel, you can shrink them down to the nanoscale, without distorting the patterns," Rodriques says. The MIT team is now exploring potential applications for this technology, and they anticipate that some of the earliest applications might be in optics—for example, making specialized lenses that could be used to study the fundamental properties of light. This technique might also allow for the fabrication of smaller, better lenses for applications such as cell phone cameras, microscopes, or endoscopes, the researchers say. Farther in the future, the researchers say that this approach could be used to build nanoscale electronics or robots. "There are all kinds of things you can do with this," Boyden says. "Democratizing nanofabrication could open up frontiers we can't yet imagine." Many research labs are already stocked with the equipment required for this kind of fabrication. 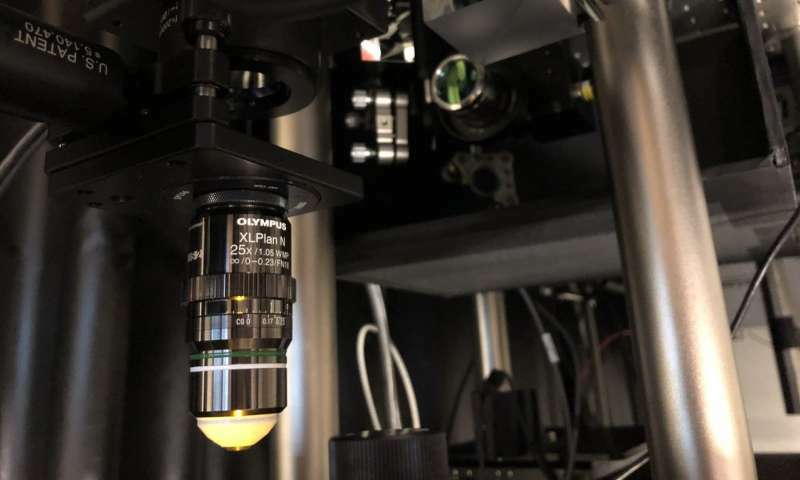 "With a laser you can already find in many biology labs, you can scan a pattern, then deposit metals, semiconductors, or DNA, and then shrink it down," Boyden says. Didn't they do this in the 70's with Shrinky-Dink, shrinkable art, put the art, either by drawing and coloring it yourself or using pre-printed pieces, and then heat on cookie sheet in the oven, and they would shrink down to less than 1/4 the original size. I can Easily see how that could be used with building your structure in the expanded substrate, prep it all and seal, then bake-shrink to fit the desired properties. Especially printing at the minimum size possible, and then do the shrink for an even tinier, denser finished product than at all possible by direct fabrication presently. I wonder if they had to let the toy patent expire first before trying this? Interesting comment, #Steelwolf. Legal side always kinda wins when lotsa mooolah involved. Think of "Mandrake the Magician", a comic strip that largely disappeared in the 1950's and DID disappear for a time in 1964. Largely gone from the funny papers for a long time, it must have survived in a few. A French linux distro from 'Mandrakesoft' called Mandrake Linux produced failure prone distros for years. One day about the time the copyright everything craze caught fire after republikkkan monopoly capitalist contributers egged them, just about every would be 'tycoon' was suing everything in sight. Mandrake Linux was sued too, and changed their name to Mandriva. Still was not enough for the copyright hog that went defunct in 2013 after several lapses in production an very limited distribution. The whole linux distro went out of print for a small time and then the workers re-booted the disstro in a new, totally redisigned 'Mageia' which is better than the old one ever was.